When I was in college, I became familiar with “Chick Publications.” They are still active, but I really have no familiarity with their work in the last 25 years. However, their old works were quite distinctive. Two I remember quite well. One was about Evolution and one was about (Roman) Catholicism. Both were pretty insulting to evolutionists and Catholics. The anti-Catholic publication had the additional quirk of seeking to blame nearly every social ill in the last 2000 years on that religious establishment. Now, this is not so unusual. People in one group tend to be good at finding the worst in other groups, but the Chick Publications works were apparently meant to be evangelistic tracts. But do insults really work as an evangelistic method? 1. A few years ago I was having a discussion with a person of the Mormon religion. I was pointing out some points of orthodox Mormonism and how these (as I see it) are inconsistent with sound Bible interpretation. He said that I was “mormon bashing.” Now I am not always a nice person. I can be a bit unkind at times, but I never could understand that. He did not argue against my understanding of his faith, and did not argue even with my basis for disagreeing with his faith. He simply felt that my statements “were not nice.” I felt he was being too sensitive (I still do)… but I suppose the level of sensitivity of a person or a group is their prerogative. 2. There has been some strong reactions to cartoons, movies, and such recently that portray the founder/prophet of Islam in less than positive light. The reaction to this has been rather strong… even violent (which not surprisingly adds to the suspicion that too much religion may be detrimental to your humanity). Christians are pretty used to denigration of our belief, our Savior, our God, and all manner of our faith and practice. So it is a bit hard understand the brittle response of some of the Muslim faith. After all, since a majority of people are not Muslim, one might think that they would already be aware that most people have a view of their founder that is considerably lower than their own. But again, sensitivity is the prerogative of the social group. On the other hand, sensitivity can be fake (let’s be honest). To squelch dissenting viewpoints by strength of argument (and character) is difficult. It is easier to “win the argument” by saying that you are emotionally traumatized and so others should stop expressing their opposing views. It is good to be kind and understanding, but laws should not be created that encourages immaturity and false sensitivity. Still, the question is whether insult is a sound missiological strategy. There may be an obvious answer, but before we get to that, lets try to look at it from a couple of standpoints. Case 1. The insulting group is a marginalized people, who are insulting the majority group. The purpose of this is primarily sociological, not missiological. It adds comfort to the marginalized group that they are in the right even though they are a minority, and perhaps even persecuted, group. It is unlikely that it will have much value in luring people to their group. If the groups function within an open society, the insults will probably be tolerated. As such, the marginalized group may find that the social cohesion gained may be worth it. An example of this is probably the Chick Publication tracts which provide social cohesion for Christian fundamentalists without drawing much of a negative backlash from the broader society. On the other hand if the broader society is more closed and marginalized groups are more tolerated than welcomed, insults may result in sever backlash. An example of this may prove to be the response in Egypt to the film produced by an Egyptian Copt (a member of a marginalized and periodically persecuted group). Time will tell. Case 2. The insulting group is the majority people in a society against one or more marginalized group. In this case the purpose often is not so much sociological as missiological (in the broadest understanding of the the term “missiological”). The effect over time often does tend to involve a reduction of the marginalized groups. This is a slow persecution seen in Middle Eastern Countries, European Countries, and frankly All Countries all over the world. In the Philippines right now is the educational program of Filipinization. While it is meant to create a common national identity, it does so by minimizing other identities. The US educational system did that in the past with the “melting pot” metaphor. Theoretically, if a religion dominates a region, it can use insult to slowly reduce the standing and number of marginal groups. Of course, this does not answer the question of morality. For Christians, burning Qurans should not be accepted (not because of any particular belief regarding that book, but because it is insulting to people who find honor and value in that book). For Christians, insulting someone for honestly seeking truth and living out those beliefs should be opposed. The opposition should be moral not legal. Passing laws to outlaw expression of beliefs doesn’t work well anyway. It seems doubtful, regardless, that denigration of another’s beliefs is a more effective method of sharing the message of Christ than living out Christ daily. For those of you wondering if I would break my code of silence on political issues – don’t worry – I’m thinking about a different type of health care challenge. I recently went on an annual pastor’s retreat. This is always a highlight of the year for Emily and me as we spend time with people we enjoy and admire and talk about the opportunities, excitement and challenges of vocational ministry. We also get to interact with some wonderful leaders from the business, political and academic world. One of our presenters this year was Nancy Agee who is the CEO of the Carilion Clinic which is the major hospital system in southwest Virginia. She mentioned four things that pastors and churches could do to help health care in our culture. RA 8981. 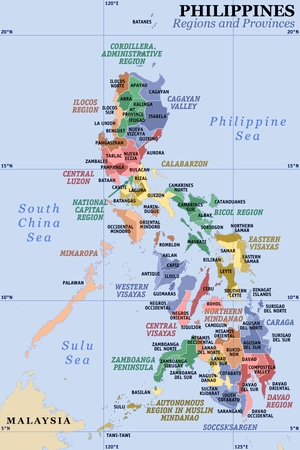 “Anti-Medical Mission” Law in the Philippines? At the bottom of this post is an article about a new Philippine Law that is deemed to be anti-medical missions. I would recommend reading the article below to decide for yourself. I am NOT an expert on this law at all… nor plan to be, since I rarely do medical missions in the Philippines anymore. The law can be looked at a number of ways. 1. It does “punish” foreigners for providing medical care in the Philippines. Ostensibly, it simply puts foreign-doctor medical missions, or the doctors themselves, under PRC (professional regulatory commission) control. However, the net effect is to set up fees, fines, and new criminal and civil penalties. In this sense, it sure seems to be harmful to the Philippines. 2. On the other hand, most medical missions done in the Philippines are done through church groups or barangays and so don’t tend to follow Philippine Law anyway. Of course, theoretically, the added teeth of the new law might squelch medical missions. Typically, Philippine Laws are so poorly enforced that it is not clear whether there will be a real change in the landscape of medical care in the Philippines. Time will tell. 3. From a third perspective, there are lots of doctors and nurses in the Philippines, and many of them are ready to help out their kababayan (fellow countrymen). We don’t do medical missions very often anymore. But I have been directly or indirectly involved with dozens of medical missions. Of them, only a few had any foreign doctors involved in it. All of them had a majority of the medical staff being Filipino citizens licensed to work in the Philippines. Medicine is also pretty available in the Philippines and a lot cheaper than in the US (for example), so shipping of medicine into the Philippines isn’t all that necessary. Financial support for medical missions is the major lacking in the Philippines (with the exception of some specialists, like facial reconstruction). 4. From a fourth perspective, I have written before about the problems with medical missions. They typically have little long-term benefit for health. They may actually encourage a lack of health infrastructure in the Philippines. There are other problems as well. Having laws that promote solutions from within may not be such a bad idea. Anyway, you can click below for an article on this topic. Part of the problem with the term “Religion” is its ambiguous nature. We don’t like ambiguity, we like duality. We want something to be perfectly good, or despicably awful. But that is just not the way things are. When we read the Bible we read of Jesus arguing with the religious leaders and we often draw the easy conclusion that Jesus was against religion, and that the religious context of 1st century Judaism was fully rotten. Yet reading the writings of Jewish religious leaders of that time, many of the leaders agreed with the ethical teachings, at least, of Jesus. With this understanding, one would see that Jesus wasn’t attacking all religious leaders, but those for whom their (personally embraced and lived out) religion had taken them away from God. Jesus utilized religious structures and institutions (such as synagogues and the temple) for quite a bit of his ministry. He challenged (some) religious leaders to reject hypocrisy and be a godly example for the people. He embraced the religious role of prophet, and at times accepted the religious role as Messiah (although rejecting some of the interpretations of that role). I rather like the following quote by Jesudason Baskar Jeyaraj, a professor of OT studies in India, because it accepts the ambiguity of religion while seeing the potential of a positive role for religion. The perspective from India helps because of the positive and negative roles various religions have played there for millenia. 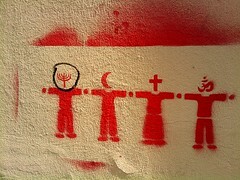 I believe that Religion can have a positive role in society once we understand its ambiguous character. The positive role I am speaking of in this case is not related to the doctrinal correctness or truth of the individual religion (as important as that may normally be). In this case, I am talking about the role that religions provide in giving meaning to individuals and communities, due to the fact that we all are religious beings… regardless of the nature of the religious (or “anti-religious”) system we embrace and live by. Religions as an organization and as a leadership structure can be part of societal evils or part of (or part of part of) the solution. Institutions, including religious institutions, are power structures in a society. Far too many of those who have authority within such structures, love the power more than they love God. In missions outreach, a missionary typically focuses on the role of the faith associated with his or her religion to transform individual lives. But a missionary should never ignore the power of his or her religion to have societal roles— roles that heal, that destroy, that rot and stagnate. As Christians, we like to believe that the Gospel message, if accepted and lived out, would have a healing role, both individually, but societally. But history provides too many evidences that as an institution, the Christian religion has too often been derailed the religious. Missionaries need to do better than simply create the religious. Christ. Some take the statement in a radical sense… never judge, never evaluate, never critique. Only the dead can (and should) exist this way. Some interpret the passage in an antinomian (anti-law) fashion. However, the lawless are as likely to be judgmental as anyone else, and to charge someone with being judgmental is, likewise, to be judgmental. Some seem to accept the passage as a bit of Christian “kharma.” If you judge expect to be judged. Neither one appears to find the concept of grace that is embedded in the passage. Instead of dwelling on a hermeneutical understanding of the passage, I would like to look to look at a few missiological implications of not being judgmental. A. One possible way of looking at this passage is that judgment should be delayed. After all, evaluation has to happen on some level. We don’t really have an option to not judge on some level at least, but we have the choice of judging from a position of knowledge or ignorance. Critical contextualization is a term from Paul Hiebert that requires first studying a culture carefully, and sympathetically, before making judgments regarding what parts of the culture are beneficial and what parts are destructive. Sharing the gospel of Christ in a culture is more likely to be successful if it has been critically contextualized. Additionally, trends over the last few decades have moved missionaries away from being experts/teachers to being learners. Effective learning again requires a certain withholding of judgment. As counselor John Bradshaw said (quoting others as well), once you are sure you are right about something, you cease to be creative and cease to learn. B. Another possible way of looking at this passage is that one needs to recognize one’s limitations. Since we are limited by time, space, knowledge, and wisdom, it is appropriate to be slow to judge. After all, Benjamin Bloom defined the ability to evaluate/judge as the highest level of attainment in understanding. It is becoming better understood that in a postmodern environment, truth and judment are not as valued as experience and “the quest.”: Some are bothered by this, but commonly this is because the training of Christians has often been built around a modernist perspective. However, since faith in the Bible is built on a level of doubt and lived out experientially, one might argue that a more effective way to share the faith is through joining people in their quest. This is similar to the findings in counseling where it is found that being a “wounded healer” is a powerful symbol to providing appropriate care. Perhaps Christians would be better witnesses if they focus on their own humanity with its limitations rather than embracing divinity with its claims of perfection. Related to this is the growning understanding that dialogue (respectful listening to and sharing of beliefs) is more effective in many environments over proclamation and apologetics. While one does not necessarily have to suspend judgment to do dialogue, it does help to be open to listen respectfully… open to learning something new. C. A third way of looking at this passage is that there are some things that we should really never judge. Sure, we can judge whether we like peanut butter and jelly over bologna and mustard, or not. However, perhaps there are things we simply should never judge. A challenge often found in evangelical circles is determing who is saved. Curiously, the Bible doesn’t really tell us, but tells us how to judge ourselves, regarding our relationship with God. Perhaps we should not judge this. Paul Hiebert, again, provides insight in this area as well with is work on bounded versus center sets. Instead of going over that again, it would be better just to get to the conclusion… one should focus more on pointing people towards Christ. It actually makes sense. If they are not a believer, you point them to Christ. If they are a new believer, you point them to Christ. If they are committed Christians, you point them to Christ. I personally believe that one does not need to embrace one single clear understanding of this passage regarding judgment. After all, withholding judgment regarding how to interpret this passage appears to agree with the spirit of the passage. Wrestling with a passage, while being slow to certainty, leaves one open to learn… and learning is good. 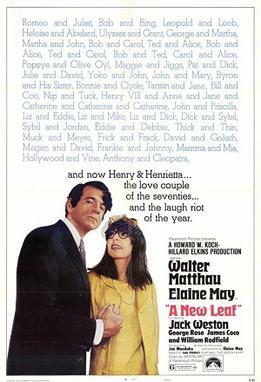 hedonist, Matthau, who decides to marry a rich heiress botanist (May). His goal is to have her die so that he can return to a life of decadent singlehood, but now with the financial resources to maintain the depravity. In the end, he finds that he has changed, and the movie ends on a more sentimental note. Obviously, the title “A New Leaf” has the double meaning of a botanist in search of a “new leaf,” and a man who “turns over a new leaf” (slang for making a major and positive change in one’s life). So a leaf can refer to a part of a plant, a change in life, …. or a page in a book. I guess that I am looking to turn over a new leaf myself. I spent several years on my dissertation and finished it. Then I turned my dissertation into three articles and several blog posts. So what should I do next? I mean, outside of some teaching and preaching, and administrating a counseling center in the Philippines. I decided to start writing an “E-book.” That’s my new leaf. But what to write about? I am tired of writing about medical missions. I could write on counseling perhaps (with my wife Celia, a certified Pastoral Counselor). Maybe later. So I decided to take a poll of sorts. I looked at which blog posts of mine have had the most hits over the last few months. Below is the table. I immediately removed “Home Page” and “About Me” from the ranking. I can quickly remove the item ranked #2 “Missions Thinking Outside of the Box.” That is because I knew from other research that people hit that one because they “googled” the phrase “thinking outside of the box” not so much because of the topic I was writing on. I can also cross off #4 for a similar reason (the term “peregrini” is a popular search engine item). I can also cross off #5 because, as I said before, I am tired of writing about medical missions. I have to cross off #7 because I, sadly, am not competent to write a book on Asian Theology… yet (or ever?). That’s nice but WAY TOO BROAD. However, I have written on topics regarding the role of myth and parable within contextualization. I have been especially interested in the role it may have within counter-cultural contextualization. If one took the hits on posts specific to that, the combined would rank it at #2. So I think that is the way I am going.